Kara, A., Budakçı, M., and Camlıbel, O. (2018). "The effect of fiberboard modification on adhesion strength to polyvinyl chloride (PVC) sheets or eastern beech (Fagus orientalis L.) veneers," BioRes. 13(4), 8295-8309. The adhesion strength was evaluated for polyvinyl chloride (PVC) and Eastern beech (Fagus orientalis L.) veneers glued onto specially produced fiberboards using urea-formaldehyde (UF), polyvinyl acetate (PVAc), and polyurethane (PU) adhesives. Inorganic fillers including rock salt (NaCl), calcite (CaCO3), borax pentahydrate (Na2B44O7•5H2O), or talc (3MgO•4SiO2•H2O) were incorporated into the fiberboards at levels of 3%, 6%, and 9%. The adhesion strength of the samples was determined in accordance to Turkish Standard TS EN 311 (2005). Scanning electron microscopy (SEM) was employed to determine the structural morphology at the bonding interface of the veneers and the modified fiberboards. The results of this study indicated that veneer adhesion strength was reduced by the addition of inorganic fillers to the fiberboard. The highest adhesion strength was obtained with Eastern beech veneer that was glued using UF adhesive on the control samples without inorganic fillers. It was concluded that UF and PVAc adhesives are not suitable for bonding PVC veneers onto fiberboard surfaces. Lignocellulosic materials may be described as the most promising class of natural, abundant, and renewable feedstocks available for the enhancement and maintenance of industrial societies and critical to the development of a sustainable global economy (Kumar et al. 2009). Large amounts of lignocellulosic materials are generated through agricultural practices mainly from timber operations, pulp and paper manufacture, and many agro-based processes (Pérez et al. 2002). Today, lignocellulosic materials have gained a special importance for product development because of their renewable nature (Asgher et al. 2013; Iqbal et al. 2013). Owing to increasing environmental concerns and legislation by government authorities coupled with the demands of industrialists, the use of the synthetic polymers and structural composites is considered critical (Iqbal et al. 2013). This concern has led to the development of sustainable, industrially useful, ecologically green bio-composite materials (Awal et al.2015; Bai et al. 2015; Vaisanen et al. 2016; Ahmad et al. 2017). As a waste-reduction strategy, the valorization of the abundantly available lignocellulosic materials has been gaining elevated attention for the production of a wide range of applications (Arevalo-Gallegos et al. 2017; Bilal et al. 2017; Iqbal et al. 2013). Such products include biochemicals, bio-fuels, animal feed, enzymes, and biocomposites (Asgher et al. 2017; Ahmad et al. 2017). The use of natural fibres and biopolymers has been of great research interest for the production of biocomposites and bioplastics (Bátori et al. 2018). However, the non-homogenous nature and the presence of lignin are the commonly perceived problems in the use of lignocellulosic-based biofibres. The interfacial adhesion between the fiber and the matrix can be improved by modifications of the fibers. Therefore, to obtain a good dispersion and distribution of fibers within a composite matrix, it is important to isolate and modify the fibers or the matrix for improved compatibility (Asgher et al. 2017). The use of wood-based board products instead of solid wood materials has been necessitated in response to the decline of forests globally and reduced availability of solid wood material. These wood-based products may help in solving problems of the increasing consumption of forest products per capita along with rising prices (Akkılıç 2002; Güller 2001; Çamlıbel 2012). By exploring the use of forest wastes, non-wood plant fibers, and synthetic adhesives, material scientists have been able to fabricate wood-based boards bearing wood characteristics but not workable as wood. As a result, this has led to the production of engineered wood board products such as chipboard, fiberboard, oriented strand board (OSB) etc. (Berkel 1970; Güller 2001; Kılıç 2006). In recent years, the use of agricultural wastes as raw materials in the production of engineered wood board has received increased attention (Youngquist et al. 1994; Rowell 1996; Youngquist et al. 1997, 1999; Ntalos and Grigoriou 2002; Batalla et al. 2005; Fowler et al. 2006; Çamlıbel 2012). However, agro-based fibers are not as technologically suitable as wood fibers in the production of fiberboard (Halvarsson et al. 2005; Lee et al. 2006). Hence, with the aim of reducing the amount of raw lignocellulosic material that is continually increasing, these agricultural wastes are currently being used along with inorganic materials in the production of engineered wood products. Generally, these inorganic materials include minerals such as kaolin, calcite, titanium dioxide, and talc, which are used as fillers and in coatings (Erkan and Malayoğlu 2001). In the furniture and decoration industries, wood-based boards on their own are not suitable for furniture production from the esthetic point of view. To be used in this area, wood-based boards need to be covered with various veneers to strengthen the physical and mechanical properties of their surfaces and edges according to their intended usage. In addition, veneers reduce formaldehyde emissions from the boards and provide a decorative and natural appearance. For these reasons, wood-based board surfaces are covered with various materials, such as artificial resin laminate (e.g., polyvinylchloride (PVC)), high-gloss acrylic, and wood veneers, the selection of which depend on the purpose and end-use (Budakçı 2008). These veneers are bonded to various engineered surfaces (i.e., chipboard, fiberboard, plywood, etc.) using different adhesives. In all cases it is essential that the veneer bonds well to the surface onto which it is applied. However, sometimes unwanted adhesion failures (irregular adhesion, rippling, blistering, etc.) occur due to pressing and user errors, as well as structural differences in the materials and adhesives used (Budakçı 2010). Previous investigations have determined that the adhesives used must be compatible with both the solid substrate and the veneer material. Depending on the area of use and production rate, polyvinyl acetate (PVAc) and hot melt adhesives can be utilized (Gillespie 1980). A number of factors are reportedly linked to the bonding of wood products using adhesives, including surface wetting ability, penetration, reaction, polymerization, porosity, pH, moisture level, extractive materials, chemical interactions, free surface energy, and the surface area of the wood in contact with the adhesive (radial, tangential, and longitudinal) (Rowell 1996; Mahlberg et al. 1998; Winfield et al. 2001). By measuring the tensile strength perpendicular to the surface and the bond quality, it became clear that to increase the tensile strength perpendicular to the surface, the board surfaces need to be covered with veneers (Özdemir 1996). To achieve the high adhesion strength required for veneer applications, it has been recommended that: (1) contact adhesive should not be used when bonding veneers to fiberboard or plywood board surfaces unless absolutely necessary, (2) PVAc or urea-formaldehyde (UF) adhesives should be selected and (3) such adhesives should be applied sparingly (150 g/m2) to reduce excess waste (Budakçı 2010). It was reported in different studies (Nemli 2000; Kılıç 2006) that the veneer type did not have any effect on the adhesion resistance. Examination of test samples where veneers had separated from the surface indicated that the rupture had generally occurred within their board layers. Moving from this prospective, the purpose of this study was to produce modified fiberboards using different proportions (3, 6, and 9%) of inorganic fillers (calcite, rock salt, borax pentahydrate, and talc), and to apply PVC and Eastern beech (Fagus orientalis L.) veneers to fiberboards using UF, PVAc, and polyurethane (PU) adhesives. 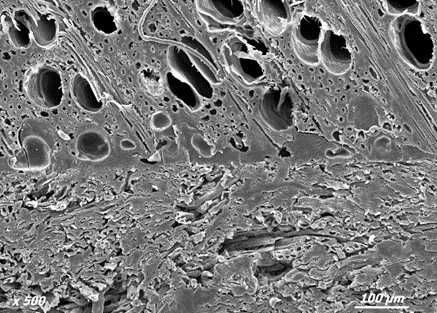 The morphology of the bonding interface between the fiberboards and the veneers was examined via cross-section images taken with a scanning electron microscope (SEM). In this study, 18-mm-thick fiberboards were produced via the method previously described by Çamlıbel (2012), which was modified to allow for different amounts of inorganic fillers to be added. Eastern beech (Fagus orientalis L.), European oak (Quercus robur L.), and Scots pine (Pinus sylvestris L.) were procured from local forest enterprises (Bolu and Düzce), and used as the raw materials. First, the raw wood materials were packed in a chipper, and then a mixture of 70% deciduous and 30% coniferous wood chips were screened in a mechanical sieve. The pretreatment of the chips was performed in the refiner unit at 180 °C under 7 to 7.5 bar steam pressure for 4 to 5 min. The pretreated chips were then defiberized in a defibrator (Asplund, Stockholm, Sweden). Prior to wood defiberization, liquid paraffin was added to the refined chips. Ammonium sulfate and urea-formaldehyde were added to the liberated fibers at the blow line of the defibrator. Filler minerals such as rock salt (NaCl), calcite (CaCO3), borax pentahydrate (Na2B44O7•5H2O) or talc (3MgO•4SiO2•H2O) were added at levels of 3%, 6%, and 9% in accordance to the fiberboard formulation. The listed ingredients were added to a separate tank with urea-formaldehyde. The inorganic filler was mixed with the urea-formaldehyde, which was added to the liberated wood fibers from the blow line of the defibrator. The fibers containing the inorganic filler with the mixture of chemicals and urea-formaldehyde entered the drying line above the blow line and were dried to 8% to 12% moisture content. The production formulations composed of the inorganic filler admixture solution mixed with the lignocellulosic materials are shown in Table 1, while Table 2 shows the additives that were used in the production formulations. The fibers with inorganic filler (0% to 9%) were spread out mechanically to dry in a homogeneous manner to form the fiber mat. The mats were formed into boards at 190 °C under 32 to 34 kg/cm² pressure for 275 s in a multi-layered press. After the sizing process, the boards were left to stand for five days to acclimate to the surrounding environment. At the end of this process, the upper and lower surfaces of the boards were sanded successively with 40, 80 and 120 grit sandpaper. The veneers chosen for the fiberboards were milled 0.6-mm-thick for Eastern beech (Fagus orientalis L.). These were compared with 0.7-mm-thick sheets of PVC. Both types of cover materials were produced in Duzce, Turkey and are widely used in the furniture and decoration industry. The modified fiberboards with inorganic fillers and the veneers or PVC sheets were cut to a size of 650 mm × 250 mm, and then conditioned in a chamber at 20 °C ± 2 °C and 65% ± 5% relative humidity until the mass stabilized in accordance to Turkish Test Standards (TS EN 311 2005). The conditioned fiberboards and surface veneers were then bonded in accordance with the manufacturer’s recommendations using Denlaks PVAc laminate adhesive (Denlaks, Istanbul, Turkey), Genfor 7055 UF (Gentaş, Istanbul, Turkey), and Kleiberit 706.1 Reactive-Hotmelt polyurethane PU (Kleiberit, Weingarten, Germany) adhesive. The bonding conditions of the samples and technical properties of the adhesives are shown in Table 3. An appropriate amount of adhesive was applied (150 or 80 g/m2) in such a way as not to exceed the target by ± 10 g/m2 by controlling its mass on an analytical balance (± 0.01 g precision). A different application device was used for each adhesive type. The UF was applied with a glue roller machine, whereas the PVAc was applied with hand-held glue rollers. The PU was applied in a glue line for flat lamination. The adhesives were applied only to the fiberboard surfaces. Multilayer hydraulic presses were used when the adhesive was PVAc or UF, whereas continuous presses were used when the adhesive was PU. The pressed fiberboard slabs were left to stand for three weeks under laboratory conditions while out of direct sunlight and air circulation. Subsequently, the cut parts were grouped and measured as 120 mm × 120 mm with ± 0.1 mm tolerances according to TS EN 311 (2005). According to a 5 × 3 × 2 × 3 × 5 statistical test design, 450 specimens were prepared as five board types, three inorganic filler levels, two veneer types, and three different types of adhesives. To obtain homogeneous adhesion between the surfaces, the veneer surface was sanded with 80-grit sandpaper, which was followed by 120-grit sandpaper. Before the test, the dust was cleaned from the sanded surfaces with a soft bristle brush and high-pressure air. Afterwards, the samples were conditioned at 20 °C ± 2 °C and 65% ± 5% relative humidity in a chamber until reaching constant mass according to TS EN 311 (2005). An epoxy adhesive (150 ± 10 g/m2) was applied to the bottom surface of a 35.7-mm diameter test cylinder; the cylinder was fixed to the center of the samples using a mold. When attaching the test cylinder, care was taken that an average pressure of 0.15 N/mm2 was applied perpendicular to the surface of the board. The specimens were left in this mold for at least 24 h (Budakçı 2008; TS EN 311 2005). The specimens with the affixed cylinders were removed from the clamping die, which were then cut around the test cylinder through the thickness of the veneer (to the carrier surface) with the aid of a circular hole cutter (Budakçı 2008; TS EN 311 2005). Adhesion strength tests of the samples prepared in accordance with TS EN 311 (2005) were carried out at the Duzce University Wood Products Industrial Engineering Laboratory using a UTEST 7012 model 50 kN universal test machine (Utest, Ankara, Turkey). The test specimens were placed on the test device with a 1 m/min cross-head speed with a constant speed for 60 + 30 s (TS EN 311 2005). where SS is the adhesion strength (N/mm2), F is the force (N) applied when tensile failure occurred, and A is the area of bond surface (1000 mm2). To determine the effects of board type, inorganic filler level, veneer type, and adhesive type on the adhesion performance, SEM images were taken of the fiberboard, and veneer interface and measurements were made on the dry adhesive film layer. To obtain clearer images for this purpose, 5 mm × 5 mm × 5 mm samples in groups of twelve were coated with gold metal using the Denton Vacuum Desk V (Denton, Moorestown, New Jersey, USA). The coated specimens were placed on the FEI Quanta FEG 250 SEM (FEI Company, Hillsboro, OR, USA) in such a way that measurements were taken from the section edge. Microscopic images were taken using the high-vacuum method. The MSTAT-C 2.1 package program (Michigan State University, Lansing, USA) was used for statistical evaluation. Analysis of variance (ANOVA) tests revealed the effects of board type, inorganic filler level, veneer type, and adhesive type factors on adhesion strength, as well as their interactions. Comparisons were made using the Duncan’s Multiple Range Test (DMRT) and least significant difference (LSD) critical values and the factors causing the difference were examined. The ANOVA results of the adhesion strengths of glued veneers on fiberboards modified with inorganic fillers are given in Table 4. The interactions among the factors such as board type, inorganic filler level, veneer type and adhesive type were significant (p ≤ 0.05) relative to the adhesion strength. The DMRT results for the board types using the LSD critical value are given in Table 5; SEM images of related samples are shown in Figs. 3 and 4. According to Table 5, the highest adhesion strength was observed with the control samples (0% inorganic filler), and the lowest adhesion strength was observed with the rock salt filler. In this study, inorganic filler levels in the modified fiberboards lowered the veneer adhesion strength versus the control. This may have been due to the fact that the inorganic minerals serving as fillers in the board composition caused a reduction in board cohesion. In previous studies, internal cohesion resistances of the carrier surfaces and the veneer adhesive surfaces have been reported in tests performed to determine the adhesion performance of veneers. In adhesion tests, it has been reported that failures usually occur not in the adhesion layer, but from within the inner layers of the fiberboards (Nemli 2000; Kılıç 2006). The DMRT results for the inorganic filler levels are given in Table 6; SEM images of related samples are shown in Figs. 5 and 6. According to Table 6, the highest adhesion strength was observed at the 3% inorganic filler level and the lowest at the 9% inorganic filler level. Depending on the inorganic filler level, the adhesion resistance decreased in parallel with the reduction of the internal cohesion of the inorganic fillers used in the modification of the fiberboards. It has been reported in the literature that inorganic fillers used at the 3% level have minor effects on the inter-fiber bonds between the fibers (Çamlıbel 2012); therefore, the experimental results at the 3% level were close to those of the control fiberboard (0% filler). When the SEM images of the fiberboards with the low inorganic filler level are examined, the adhesive is visible between the board fibers, thus creating mechanical adhesion. An increase in the proportion of fillers prevented the formation of mechanical adhesion, and thus reduced the adhesion of the veneer. The DMRT results for the comparison of the veneer types are given in Table 7; SEM images of related samples are shown in Figs. 7 and 8. According to Table 7, the adhesion strength was highest with the beech veneer, and the lowest with the PVC sheet covering. It may have been that the high adhesion strength of the beech veneer was due to its porous structure. The adhesives presumably filled these voids, thereby forming strong mechanical adhesion. In previous studies it was reported that the bonding of wood material with glue varies because of differences in surface wettability, penetration, reactivity, polymerization, porosity, pH, moisture levels, extractive substances, chemical interactions, free surface energies, surface area, and adhesive contact with the wood surface (Rowell 1996; Mahlberg et al. 1998; Winfield et al. 2001). The DMRT comparison results for adhesive type are shown in Table 8; SEM images of related samples are shown in Figs. 9 and 10.